Is it snowing in Hemsedal ?Thank you! Hemsedal in Norway is a large resort with 21 lifts (6 chair lifts, 15 surface lifts) that offers skiers an impressive 800 metres (2625 feet) of vertical descent. 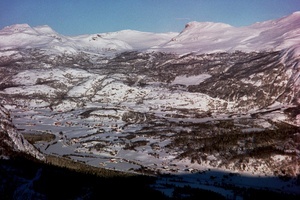 Hemsedal has 415 acres of terrain with 46 pistes. Hemsedal is best suited for intermediate skiers and snowboarders but there is a also a lot of terrain for beginners and experts too. 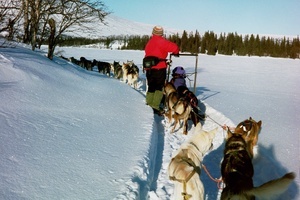 There are 220 kilometers (138 miles) of cross country ski trails at Hemsedal. For snowboarders, there is a terrain park and 2 half pipes. 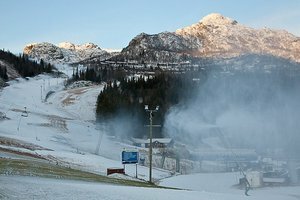 About one quarter of the pistes at Hemsedal are covered by snowmaking. The closest airport is at Oslo but the transfer time is 2.5 hours. 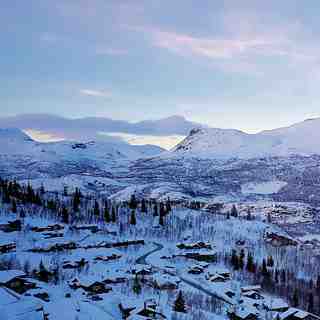 The nearest train station to Hemsedal is at Gol. There is accommodation located close to the pistes but we would welcome additional information about any hotels or chalets in Hemsedal. We spent a week skiing in Hemsedel with Crystal in late Jan 2014. The flight was an easy 1 hour 20 mins from Gatwick and the transfer an hour and a half through picture postcard landscape. We had a three bedroom apartment for two couples at Panorama, half way up the mountain and with a small easy piste passing 50 metres from the apartment. It was nearly ski in ski out. The apartment had spectacular views over the pistes to the valley below. We were self-catering so had to be well organised with the food shopping, but a combination of expeditions via the ski bus and daily visits to the well-stocked shop at the Alpin Lodge, to pop basics in the back pack, did the trick. The rep also organised a food welcome pack which was a great touch. As four older adults, a pitcher of beer for ‘after-ski’ watching some great live bands for an hour or two, was plenty. Then back home and into the sauna. Drink is very expensive in Norwegian bars, but so it is in the Alps. However, low strength beer, in the supermarkets, is similar to UK. With some duty free gin from Gatwick we were sorted. It was also possible to walk up to the beautiful hotel for a £9 pint, or a posh meal with spectacular views. 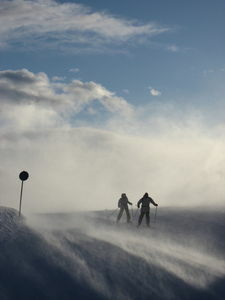 The skiing was perfect for four cautious skiers, plenty of easy long wide greens with good elevation. The piste map shows a green from the top of the highest mountain ‘Totten’, but I would say this was a challenging blue, near red, in parts down to mid station, having said that there is plenty of good easy skiing from the top of the 8 chair express lift, from mid-station down. The pistes were nearly empty during the week, very wide in parts and lift queues were rare, in all very relaxing skiing. We were lucky with the snow, when we arrived they had three weeks of heavy snow previously and we had several inches of snow every night and light flurries during the day. The last three days was knee high champagne powder. The temperature was -10 to -15, which is manageable with the right kit. The ski gear was easy to hire as there was a shop, ten minutes’ walk up to the Skarsnuten Hotel. Crystal Holidays were very good with an excellent resort rep, offering lots of exciting non-skiing options such as dog sledging etc. Having done these trips before in Finland and being on a tight budget we did not partake, but there was plenty to keep non-skiers amused. Being out of town and up the mountain meant that one had to be savvy with the ski bus timetable, but as we were at home every evening it was not an issue. With a late flight on the Sunday we were able to ski in the morning which was a bonus and in all, by avoiding partying the night away, this was an excellent value for money ski holiday. A good resort, great skiing and great people.